Finding seashells is often a matter of being on the beach at the right time. It would be great if we could all plan our trips to Marco Island, Naples, Bonita Springs and Ft. Myers/Sanibel/Captiva when we knew there were going to be strong winds and storms but that’s not usually possible. So here are the top 5 Tips for Finding the BEST Shells here in Southwest Florida. The best time, in general, is at low tide especially when the tides are low early in the morning. Finding seashells is often a matter of being on the beach at the right time. It is especially good after strong winds or storms. Low spring tides during full moon or new moon periods can be even better than usual. Any strong tides or Gulf storms can also bring plentiful shells to the Gulf area beaches. There’s a good chance other people are also out collecting shells, so the earlier you arrive, the better. This way you can beat the crowds and frankly it is a beautiful time of day being a bit cooler and the sun isn’t so bright. 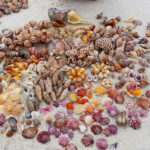 One of the benefits of going on a shelling tour with a company like Treasure Seekers Shell Tours is we can get you to the uninhabited islands of the Ten Thousand Islands that are only accessible by boat so they don’t receive the shelling pressure like populated, mass tourism islands like Sanibel/Captiva. Many times you will be the only person shelling the entire duration of your tour. You can check out www.tides4fishing.com and check out the beaches where you will be vacationing or shelling to help you plan the best time to come here to Southwest Florida. We only book our tours based on the best available tides during your stay here in Southwest Florida so that means our tour times change daily. SHELLING TIP #2: TAKE YOUR TIME! We often are in a rush to get down the beach first to find the good stuff, and yes there is a strategy to that when your with a larger group, but for the most part….the shells will find you! I feel like God gives us all special gifts to let us know how much He loves us and thinks of us as treasures. Many times its when your not expecting it -the elusive Junonia will roll up onto your feet as several other people just walked past the same exact spot. Bend over, stop and just search the wrack line. Sometimes just sitting down for a minute by a large pile will help you spot a delicate Laced Murex, Nutmeg, Wendletrap or a Gaudy Natica that you might have passed by if walking. While exploring a few years back with a dear Shell Sister, Damien Lin, she said that famous line to me and I really didn’t know what she meant. Frankly, she just said stop and bend over a stump and peer into the middle….you never knew what beautiful seashell got tossed inside during the last high tide or storm. Walk over to the large boulders by the jetty and look behind the rocks. Climb into a thick mangrove clump. Be careful to not get hurt, take your time but you never know what others passed up! Many times on our tours in the Ten Thousand Islands Wildlife Refuge the best shells are found in or below the wrack line (where the debris can be found from the high tide the night before). 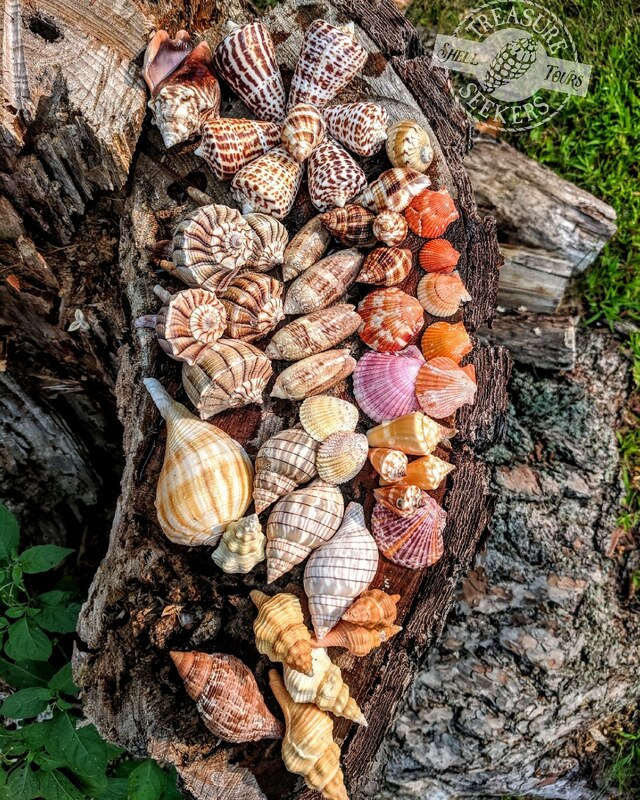 If you venture up too high you will find older sun bleached shells (which also can be beautiful) but many collectors are looking for the bright colorful newer shells that just washed up the night before. The mangrove stumps on Kice Island, where we run the tours, typically hold their shells right at where the sand starts and is wet and you can see the mangrove roots sticking up. SHELLING TIP #5: BRING YOUR KIDS! Lets face it kids are short, have terrific eyesight and seem to have an innate capacity at finding treasures. Many times it’s the children on our shelling tours that find the rarest shells. Let them Dive In, Get Wet and Explore! 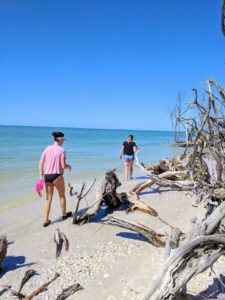 Picking up seashells is a great family friendly way to bring home a special memento from your trip to Marco Island, Naples, Bonita Springs or Ft. Myers/Sanibel/Captiva. The Gulf Coast surpasses all other beaches for finding the most shells. 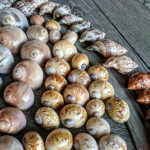 We have over 400 species of seashells here in Southwest Florida. It’s not only addictive, it’s a great way to learn about our ecosystems and how to help protect what we love by conservation and recycling. Kids who learn to travel will travel to learn. Children are natural explorers and there is nothing better for them than to climb, search and see, touch, dig and learn about new marine life in an up close and fascinating way. They will have SHELLTASTIC stories and memories that will last a lifetime! Seashells are like love letters in the sand. May you always have shells in your pockets and sand between your toes. 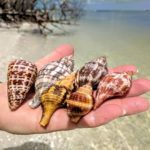 I hope these few tips will help you in your decision on when to come to the Gulf Coast for a shelling vacation. Let the sand slip softly under your feet. Spend a little time of reflection and search for the outward simplicity….let the waves wash away your cares and enjoy the VitaminSea! Let the waves wash away life’s cares and worries, feel the sand between your toes and feel the warm sunshine kiss your shoulders. Slow down-breathe in the salty air, listen to the gulls and Osprey chirp overhead as you meander through mangrove roots & sandy beaches looking for the elusive Junonia, Rose Murex or Chocolate Alphabet Cones the 10,000 Islands are known for. Treasure Seekers Shell Tours, LLC.